Published Feb 5, 2016 by Sams. Part of the LiveLessons series. This video course teaches Mac pros everything they need to know to use Excel 2016 including how to build advanced formulas using functions and named ranges of cells, how to create a visually attractive worksheet using formatting and a variety of charts and graphics and valuable tips and shortcuts that help you work more efficiently as you build worksheets and workbooks. Microsoft Office has long been the industry standard for business. Mac users, especially at the enterprise level need to understand and use Word, Excel, PowerPoint, and OneNote in order to collaborate with business teams. Viewers will learn to work efficiently using the industry standard tool of Excel 2016. Throughout the course of this LiveLesson, students move from the basic topics to advanced topics. Along the way, Mac-specific techniques are covered in detail and students learn how to customize Office applications to match their own work needs and style. This course goes in depth on Excel and will include sample files that students can download and use. For Excel, students will learn how to build complex formulas, and perform database-type operations in a spreadsheet. Some topics that apply to multiple Office apps include: adding audio and video to work files, collaborating with teams while tracking changes, recording and running macros for repetitive tasks. Providing this course as a LiveLesson gives professionals the ability to quickly zero in on the topics where they need help. Students will learn the steps for complex tasks Excel pivot tables by seeing them performed. In short, they’ll build solid skills more quickly and efficiently than they would by reading a book. Chris Grover has had extensive experience helping colleagues and clients solve common business problems using Microsoft Office and other information technology tools. Chris’ public venues include presentations to computer user groups and professional associations. Chris has authored articles for a variety of magazines and online publications including Fine Homebuilding, Family Handyman, CD-ROM World, and MacWorld. 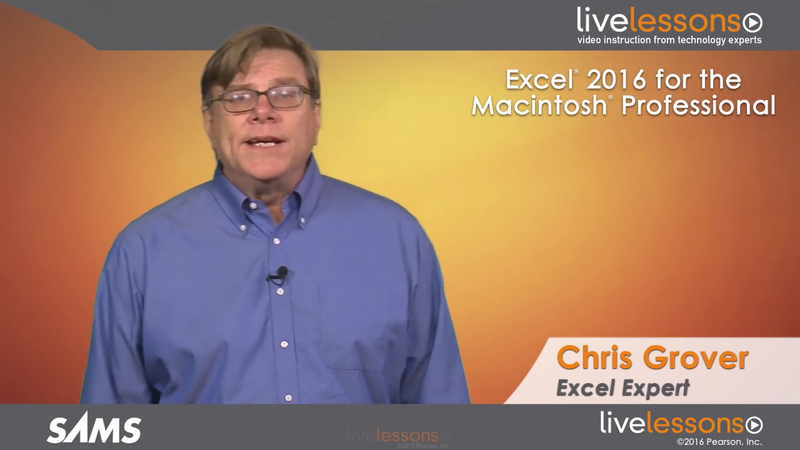 Chris is also the author of the bestselling book on the topic, Office 2011 for Macintosh: The Missing Manual. In business, it is expected that employees know how to use apps like Excel; Basic skills are covered quickly to bring students up to speed; students will quickly learn skills that will benefit them in their studies and their workplace. Zero in on Mac-specific topics and the areas where using Office for Macintosh is different from its Windows counterpart. Discover new ways to collaborate with colleagues. Learn how to work smarter and faster with Excel. Leverage course materials to assist in learning the more complex topics such as creating a database in a spreadsheet. This LiveLesson will be of interest to nearly all Mac users, but the emphasis is on professionals working with Office on a Mac. While Windows users have seen more frequent updates of the Office apps, it has been about five years since Mac users have had a new version. Streaming–Watch instantly as the video streams online in real time; after purchase, simply click Watch Now to get started. Download–Download video files for offline viewing anytime, anywhere; after purchase, simply click the Download icon within the player and follow the prompts. Lesson 1 takes viewers on a tour to learn the basics functions and capabilities of Microsoft Excel. Viewers well learn how to get around, use the ribbon, input data, format cells, use shortcuts, select ranges, use templates and more. Lesson 2 introduces viewers to the skill of building formulas. Viewers will learn about references cells and ranges of cells, how to build simple formulas, understand references, how to use built-in functions, the Goal Seek tool and how to address errors. Lesson 3 gets viewers into using Excel as a database. Viewers will learn how to make lists with Excel, how to build, format, sort, and filter data tables, calculate with data, and how to build a pivot table. Lesson 4 introduces viewers to macros and how to record, run, and edit them. Viewers will also explore Visual Basic. Lesson 6 covers all aspects of printing Excel spreadsheets, including how to preview them, adjust settings to fit a page, and print headings, single, and multiple worksheets. Lesson 7 teaches viewers how to share spreadsheets and shows how to import data from others sources and how to export data from spreadsheets. Viewers will learn how to add and delete comments, as well as track changes made to a spreadsheet.